I’m back with more from The Skinny on Weight Loss Sisters. Here are their videos discussing weight loss goals and Holiday strategies – from Christmases past and present. I love how open, honest and real they are in sharing their struggles and successes. Anyone who has struggled with their weight will relate to these weekly videos where they share their weigh-in results, ups and downs, recipe ideas, food finds and favorite discoveries. I’m a big fan and think you’ll be too. Enjoy! Setting goals for the weeks prior to Christmas & heading into the New Year. Kelly was up a little over a pound this week but is feeling good because she feels like the biggest challenges of the holidays – her 50th birthday and Thanksgiving are now behind her. Kim was up 0.6 and was happy with that. 4 weigh-ins until Christmas Eve. They are feeling good and in control. Planning and accountability for New Year’s Eve. Change it up and maybe go bowling instead to be active and less focused on food. Takeaway: Set your goals for the month. The whole month is not a holiday. May conveniently opt-out of certain events. Stay on plan on the days that don’t included events. “Wrap Fest” – gather with friends to gab, eat, drink, gossip and wrap Christmas gifts – is a “danger” event. Need to bring alternative foods. Doesn’t want to experience the food coma/misery that comes with excessive overindulgence. Talk with their girlfriends ahead of time and reign in the food a bit. Hunt for healthier lower point sweet treats. Realized that they have become lax with tracking the last few weeks. Healthy Kitchen Finds: Air Fryer which they used to cook frozen sweet potato fries that turns out crispy and delicious! They’ve been shaking up their food, trying new things in attempt to find more satisfaction with what they are eating. “Before” Photo of “Wrap Fest” when the sisters were much heavier. It was exciting to have a visual of just how far they have come with their weight loss journey. 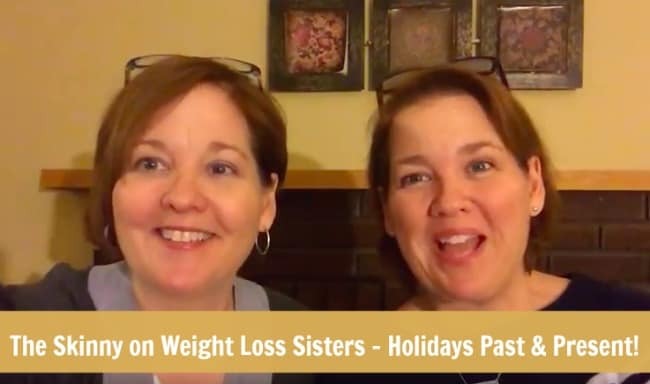 Skinny on Weight Loss Sisters Video: Week #2 Weight Watchers, The Skinny and The Holidays! Here the sisters discus the holidays last year. Kelly gained 0.6 this week and was a bit disappointed because she had expected a loss. Kim lost 0.6 and had expected to lose and was happy about it. Second week on the new SmartPoints plan and one holiday left to go: New Years! What’s your New Year’s Plan? Are you going out dancing? Will you be drinking? They will go to a New Year’s Eve event where there will be tons of food. To help stay on plan they will be taking a big bowl of fruit. And a new Appetizer where you take slices of ham and spread them with a light layer of cream cheese and wrap around a dill pickle spear. Cut the log into 3 pieces. Suggestion: Bring something that you really enjoy that is on plan so you don’t feel deprived. Try to avoid the food table. Good at Christmas. They pre-tracked their meals both Christmas Eve and Morning. Have found better success sticking with plan when pre-track your meals. Ask for what you want. Most restaurants will accommodate you. Moving into the New Year and winter eating. What are ways to be successful during the winter. One idea was to substitute your own “healthier” frozen meals instead of depending on the mass produced frozen dinners, some of which have gone up in points. Make a slow cooker recipe and then portion it out and place it in the freezer for easy grab-and-go lunches and dinners. The slow cooker is great for easy high protein meals with minimal cooking. Use already cut up meats, proteins and frozen veggies. Another great alternative is to make quick and easy meals in a pressure cooker or the instant pot. The key is to find 6-12 “go-to” easy meals you can turn to. Goals for the week: get movement in, get to the gym for 30 minutes of cardio, track, track, track and pre-track, go to your meetings. Favorites of the week: Healthy breakfast sandwich made with Thomas’ Bagel Thin (3SP) with 1/4 cup egg beaters (0S), 1 slice of Kraft Fat Free singles cheese (0SP), Jones Farm All Natural Fully Cooked Chicken Breakfast Sausage (2 links – 1SP) So the entire sandwich has just 4SP and is very tasty, filling and satisfying breakfast. WW Connect – If you are a WW Member, “connect” is a way to interact with other WW members through your WW APP. It’s a very positive supportive community. I would love to receive your weekly recipes.